Nandini (Aishwarya Rai) is the daughter of classical singer Darbar (Vikram Gokhale). 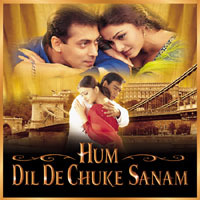 Sameer (Salman Khan) is half-Indian settled in Italy who comes to his homeland to learn music from Nandini's father. Games, pranks, and light revelry mixed with marriage sequences, kite-flying festivals, etc. make up most of an imminently enjoyable first half. Towards the end of the first half enters Vanraj (Ajay Devgan), a family associate of Darbar. He falls in love with Nandini seeing her at some occasion. Sameer is about to declare his love but he learns that Nandini is to be married to someone else as per her father's decision. In accordance with family traditions Nandini gets married to Vanraj but at heart she still loves Sameer (Salman). Within a few days of there wedding Vanraj comes to know that Nandini loves not him but Sameer and he decides to give back her lover and helps Nandini. Aishwarya is prefect as the hot-tempered, out spoken and stunningly beautiful Nandini. She is even brilliant in her dancing. Salman Khan has got a normal lover role but unlike his other movies he has done a few emotional scenes is a praiseworthy way. Ajay Devgan also puts in as a very fine restrained performance in one more serious role. Music and cinematography are excellent. In fact after the movie is over the scenic beauty of movie lingers for a long time in your mind. The songs are already a great hit. Whether it is the slow, nice song "Hum Dil de chuke sanam" or the loud music of "Dholi taro", they are worth listening many times. After the boring movie "Khamoshi" Sanjay Leela Bhansali comes with a heart throbbing movie worth praising. However, movie definitely has flaws. The major one being its length; even with the high production values we find a bit long. This movie has got a direct effect on your heart and so keep your 'kerchiefs' ready! For the rest, the music & fine performance by the lead players attracts a big crowd to the theatre. Worth seeing movie in theaters. Super hit movie of 1999.